“That’s it? For two drunk driving offenses? For murder? The family of Kris Carew, 17, of Holbrook tries to stay strong with the upcoming 3-year anniversary of the day he was killed by a drunken driver. They are, from left, twin brother Nick, 20, sister Jessica, 26, and parents Nancy and Glenn. The first time Russell Curran was caught driving drunk he was ordered to get counseling. The next time he killed two people. 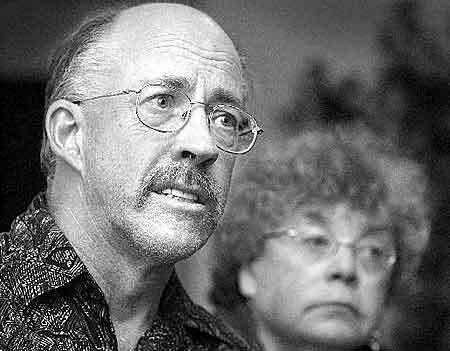 If Curran learned his lesson in 1995, he had forgotten it by Sept. 22, 2001. After work that day, he went out drinking. At the end of the night he climbed into his Pontiac Firebird and headed home to Rockland. At the same time, Lisa Squillacioti and her fiance, James Broadbent Jr., were returning from Hanson to their home in Everett in her Ford Taurus. Curran was weaving down Weymouth Street in Rockland at 90 mph when the cars collided head-on. The couple was killed. Curran broke his ankles. With one drunken driving conviction already on his record, families of the victims thought Curran would spend the next 10 years behind bars. Instead, he was sentenced to 3 to 4 years. If he behaves in prison, he could be out in 32 months. James and Donna Broadbent recall the death of his son, James Broadbent Jr., and his fiance, Lisa Squillacioti. The couple was killed by a drunken driver two years ago in Rockland. "We have a life sentence of seeing two children grow up without a father," said James Broadbent Sr. of Abington. Families who go to court expecting long prison time for drunken driving deaths are often disappointed by sentences that can be as lenient as probation for a first-time offender and seldom harsher than 5 to 7 years, even for someone, like Curran, with a prior conviction or convictions. The problem is a legal system that can't decide whether drunken drivers are criminals who should be punished or are alcoholics who should be treated for their addiction, experts say. The result is a mishmash of sentences that can include community service, probation and required treatment, but seldom the hard prison time victims' families say is warranted for justice to be served. "They see these cases similar to a murder case. Somebody gets behind the wheel under the influence; it's like picking up a gun. They feel they should have the same penalties," said Mary Glavin, a victim and witness advocate for the Plymouth County District Attorney's office. But the state's judicial system doesn't treat drunken driving homicides that way. Sometimes, prosecutors agree not to push for tough sentences because the defendant is a friend or relative of the victim, or is someone who is very young and repentant. Even in cases involving repeat offenders, lawyers often argue successfully that the defendant never intended to harm anyone. All those factors have made drunken driving homicides something of a special status crime in Massachusetts, said Barbara Harrington, executive director of the state chapter of Mothers Against Drunk Driving. "That's why things still aren't so clear cut here," she said. Massachusetts' drunken driving law is 18 pages long, compared to the statute on murder, which is one paragraph, Harrington said. "We are very clear about murder, but we are in a fog about drunk driving. That's why the law is so elaborate and the results are still uneven and unsatisfactory,"she said. In 17 drunken driving homicide cases reviewed by The Patriot Ledger since 1993, eight defendants received 21/2 years in jail or less. Victim advocates say they tell families to expect no more than 21/2 years in jail for a drunken driving homicide. 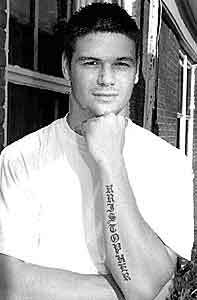 Nick Carew, whose twin brother, Kris, was killed at 17 by a drunken driver, has Kristopher tattooed on his arm. Even so, the family of Kristopher Carew, a 17-year-old killed in a drunken driving accident in Holbrook three years ago, expected more. The defendant in the case, Richard Abbott, had at least one other drunken driving conviction on his record. In September 2000, Abbott's car smashed into the one in which Kris Carew, his twin brother, Nick, and Nick's girlfriend were riding. Abbott was sentenced to four to five years in prison. Prosecutors told the family they were lucky to get that much. The family doesn't see it that way. "That's it? For two drunk driving offenses? For murder? You ought to get more than four years," Glenn Carew, Kris's father, said. Sentences sometimes strike families as being so unfair that they feel they must take action. 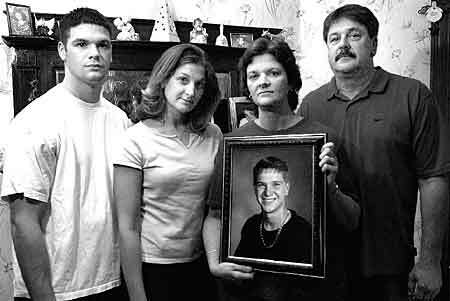 The family of Jason Roberts, 21, who was killed in a Weymouth drunken driving accident in June 1996, spearheaded a law that requires victims to be notified whenever a defendant is released early from jail through an alternative sentencing program. In that case, Roberts' family did not know the defendant, John Callahan, had been released from jail with a bracelet monitor until they spotted him at a local shopping mall. "It was very disheartening. said Roberts' mother, Pauline Quirk of Pembroke. "I did come away with no sense of justice." But not every family sees the need for long prison sentences in drunken driving homicides. Majid Palwala's wife of 23 years, Momin, was killed in December 2000 when a drunken driver struck the mini-van carrying the family. Still, Palwala did not want to see then-19-year-old James J. Gray pay for the mistake with a lengthy jail sentence. He just wanted him to never drive drunk again. Gray was sentenced to serve one year of a two-year prison sentence. "I didn't want him in jail for 10 years," Palwala said. "He made a mistake and we suffered.